Chelsea looked like a different team to that who have been playing in the Premier League recently and put in a solid performance against a Porto side that were far below their usual standards. Chelsea had no major absences and Mourinho chose a pretty standard XI in their usual 4-2-3-1 formation. Porto were without Osvaldo and Andre Andre however Lopetegui went for something a bit different. He left out regular starters Aboubakar and Neves and opted for a 3-5-2 formation, trying something completely new in this hugely important match. It was a classic Champions League performance from a Mourinho Chelsea side. They didn’t look to play an expansive game and allowed Porto around 60% of possession. The fullbacks stayed relatively deep and narrow during possession, reducing their vulnerability in defensive transition The London side were incredibly assured defensively however, looking to make the most of counter attacks and set pieces. When defending in their own half, they adopted two lines of four with Matic sometimes asymmetrically behind Ramires while Oscar would drop back. 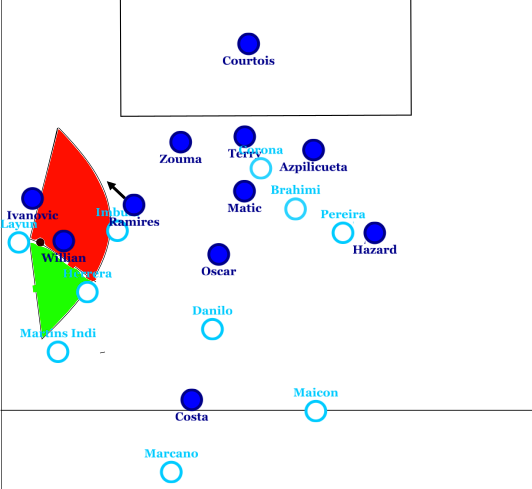 When Oscar dropped back into the midfield line in the defensive phase, Hazard would move higher and more centrally Chelsea could often play with a good degree of horizontal compactness due to Porto’s lack of high width in possession (something I’ll take a look at later). 1. 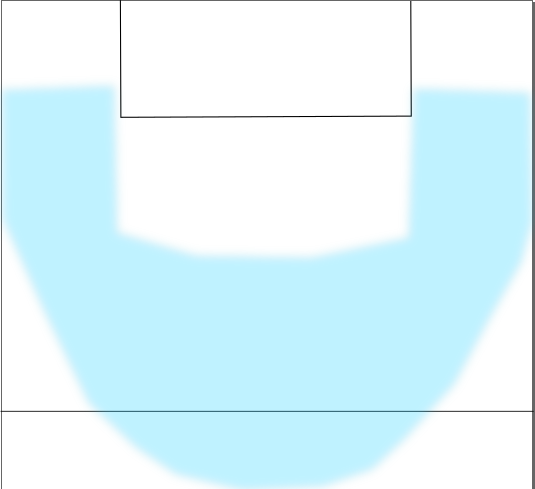 Layun’s field of vision, the red area is too well covered to play a ball into, he is forced to go backwards. 2. Something we don’t always see from Chelsea-as they ball is played back from Layun to Martins Indi and then to Danilo, Chelsea move up and restrict Danilo’s forward options, forcing a pass which rolls behind Maicon. 3. Maicon receives the ball in isolation due to both Porto’s poor structure and Costa’s fantastic pressing work rate. Hazard blocks the ball up the line and Matic has moved across very well to block a low pass into the forwards. Maicon has to play a rushed high ball towards Brahimi (Brahimi, Corona, Pereira and Layun are all under 5’9″) which is won by Terry. Chelsea regain possession. In middle third circulation, Porto’s three centre backs spread out with Marcano dropping deeper than Maicon and Martins Indi. Danilo was stationed slighlty ahead of the centre-backs and occasionally dropped in these spaces either side of Marcano. Layun and Pereira moved just ahead of Imbula and Herrera and stayed in the flanks. 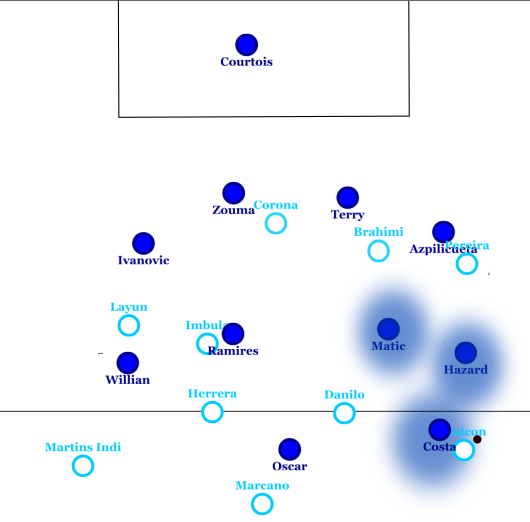 Corona would often move from side to side on Chelsea’s defensive line while Brahimi would roam, linking up play all over the field and trying to create overloads. His presence was very useful in situations where there was high pressure on the ball as he is very proficient at twisting and turning out of pressure with the ball at feet. Porto’s central overload allows Marcano to play a long vertical ball through to Brahimi in between the lines. The above was by far the best aspect of Porto’s play all evening. It was refreshing to see a team use numerical superiority to find dangerous vertical passes into the space between the lines rather than run the ball through unprotected wide areas or simply hoof it long and hope for the best. Despite Porto’s proficient middle third possession in most cases, as soon as they reached the final third they would pass it wide. Almost every time. Corona’s movement was absolutely dreadful and he often pulled wide rather than making a run behind Chelsea’s defensive line. 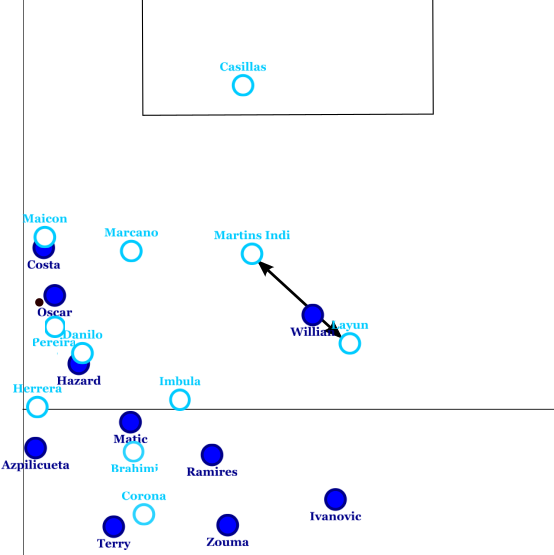 Porto also lacked commitment in attack, with Imbula and Herrera rarely making runs in and around the penalty area. Also, Porto’s possession in Chelsea’s half was often too slow, delayed and aimless. Chelsea’s organised defence as well as Porto’s dour attacking play meant that Porto only had four shots from inside the penalty area all match. 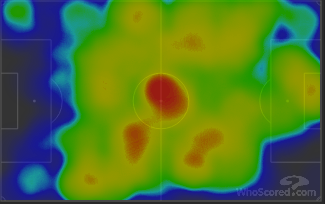 The heatmap below shows how Porto has so much of the ball in the centre of the pitch, but had very little in the final quarter. Porto’s heatmap. Attacking from right to left. Another reason why Porto’s 3-5-2 was unsuccessful was the lack of width in high areas. Porto’s wingbacks were never both high up the pitch at the same time. Wingbacks in a 3-5-2 must provide height and width, with Juventus displaying this fantastically in recent years, especially under Conte. Below shows how this allowed Chelsea to keep a horizontally compact defensive shape. 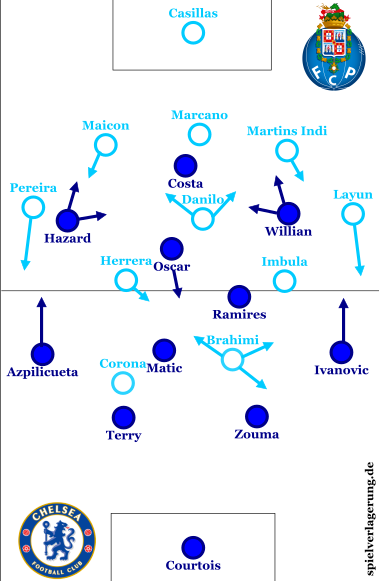 Chelsea can defend in a compact shape due to Porto’s lack of width and bodies forward. Porto moved the ball in areas shown below. Start central and moved wide instead of the other way round. Another problem that I have already touched on a couple of times, is Porto’s lack of central penetration in the final third. This was due to Brahimi dropping deep while Corona was often wide and static off-the-ball. Again, Porto’s central midfielders rarely made bursting runs into the final third. Porto moved the ball in the shape shown to the right. Below, we can see a scene where Porto are in organised attack, not a transition, and have no players centrally or making runs into this area. Porto static with the ball, no centre-forward, poor possessional structure. 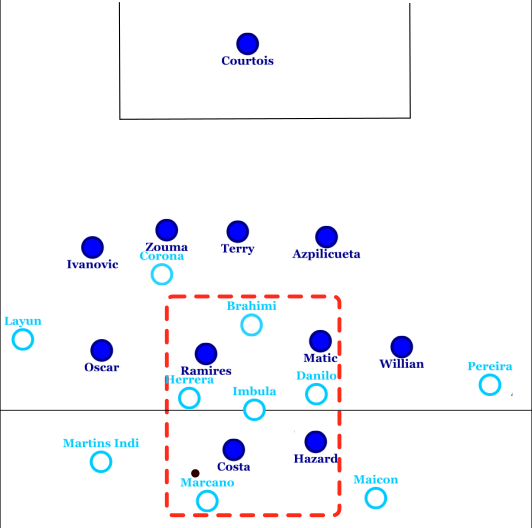 Also, Porto’s 5-3-1-1 defensive shape meant that they posed absolutely no threat on the counter attack. when they won the ball, their wingbacks could not get high up the pitch quick enough and the ball was often played to Corona who was isolated and could not build a counter attack. Porto, who were helped by the fact that Chelsea aren’t particularly threatening in built-up attacks, didn’t defend too badly in the controlled defensive phase. They adopted a 5-3-1-1 shape and didn’t put much pressure on the ball however did man-mark dropping runners which was effective as Chelsea have a poor possessional structure a Chelsea player who received the ball in a tight area didn’t tend to have someone to offload it to. However their new system wasn’t transition proofed whatsoever and there were often large spaces in defensive areas. Chelsea attack quickly and move up the pitch quickly. This often caught out Porto as Layun and Pereira wouldn’t move back into the defensive line until the ball was in their own first third. 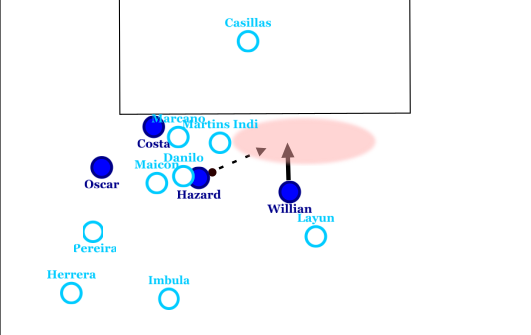 This, combined with Layun’s lack of concentration allowed Willian to find droves of space and make it 2-0 to Chelsea. 1. The ball lands at Oscars feet, he can turn and look forward. Poor horizontal compactness in the Porto defence. As Chelsea move the ball into a dangerous area, Martins Indi tucks in however Layun isn’t quick enough to track Willians forward run. Porto’s defensive structure cannot react to a vertical Chelsea attack. Chelsea found their form when it really mattered and will hope to bring this form into their tough fixture away to Leicester on Monday night. They are still far from fantastic with the ball however they can afford to work on this if they manage to maintain the defensive solidity they showed in this fixture. Lopetegui chose the wrong system and the wrong personel. Porto were pretty poor and didn’t really threaten Chelsea all match. If they can replicate some of the form they have shown previously in the Champions League this year they will be definite contenders for one of the strongest Europa league last 32s ever.